The Napa H.S. 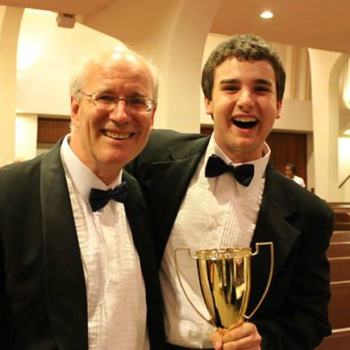 Choral Music Dept. 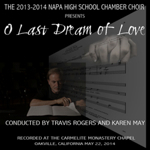 Featuring Z. Randall Stroope's "O Last Dream of Love" and many other powerful and beautiful arrangements comes this offering from the Napa High School Chamber Choir in May, 2014. Super beautiful choral singing by the multiple award-winning Napa High School Chamber Choir in May of 2013! The Napa H.S. Chamber Choir's offering at the Mt. 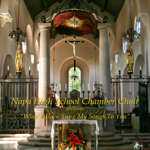 Carmel Chapel, December 14th, 2013, with special guests the Napa H.S. Vocal Music Workshop! 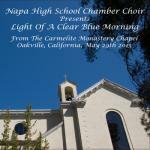 Haunting and beautiful choral pieces offered for you by the Napa High School Chamber Choir, from May, 2012.! From the Napa High School Vocal Music Workshop, 2013-2014 school year, you'll need titanium headgear to handle this radioactive set of awesome vocals! From the Napa High School Vocal Music Workshop, 2011-2012 school year, comes this amazing set of tracks! The Napa High School Chamber Choir wishes you Merry Christmas, Happy Hanukkah, and a Happy New Year with 27 songs of the season, from Christmas 2012! The Napa High School Choral Music Department has been raising the bar for excellence for almost 40 years under the direction of Travis Rogers, department head. Just sampling the clips provided will show you just what Travis has been up to all this time. Lovers of choral music owe it to themselves to have these recordings in their libraries!